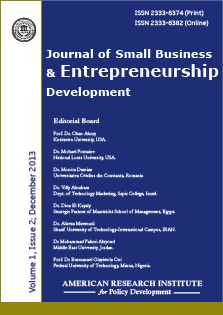 Journal of Small Business and Entrepreneurship Development is a leading international scholarly journal in the field of small business and entrepreneurship studies. The journal's aim is to publish original papers which contribute to the advancement of the field of entrepreneurship. It publishes conceptual and empirical papers mainly for the interest of scholars, consultants, academicians and public policy makers. The journal attracts submissions from international academics focusing upon theoretical, empirical, policy and practitioner issues within the fields of small business and entrepreneurship. The journal's contents reflect its integrative approach - including primary research articles, discussion of current issues, case studies, reports, book reviews and forthcoming meetings. The journal is dedicated to the formulation, development, implementation and evaluation of enterprise policy. Theoretical research articles and evidence-based case studies seek to explore best practice, investigate strategies for growth, and to assist and inform those responsible for the management of SMEs. Papers accepted for publication are double-blind refereed to ensure academic integrity. Each paper published in Journal of Small Business and Entrepreneurship Development is assigned a DOI®number, which appears beneath the author's affiliation in the published paper. Click HERE to know what is DOI (Digital Object Identifier)? Click HERE to retrieve Digital Object Identifiers (DOIs) for journal articles, books, and chapters. Prof. Dr. Okan Akcay, Kutztown University, USA. Dr Federico Topolansky Barbe, School of Business and Entrepreneurship, Royal Agricultural University, UK. Dr. Oguz Demir, Istanbul Commerce University, Turkey. Dr. Gabriela Fotache, George Bacovia University, Romania. Dr. Iris Mihajlović, University of Dubrovnik, Croaitia. Prof. Julio Araujo Carneiro da Cunha, Paulista University, Brazil. Dr. Vedat Akman, Beykent University, Turkey. Prof. Dr Emmanuel Olayiwola Oni, Federal University of Technology, Minna, Nigeria. Dr. Agnes W. Njeru, Jomo Kenyatta University of Agriculture and Technology, Kenya. Dr. Palmarudi Mappigau, Hasanuddin University, Indonesia.